As the date for Brexit looms closer, there is widespread speculation about how it will affect Ireland's fortunes. Even far away in Australia, there is regular reporting about the challenges and choices for Ireland. But whatever happens next, there is one big reason to be optimistic about Ireland's prospects as Europe emerges from this turbulent moment. Ireland is a dynamic, progressive, rightfully proud and vibrant nation. The world looks admiringly to Ireland for what it has achieved and what it represents. As a country, Ireland embodies hope. Economically, Ireland has over the last several decades built a highly productive workforce that is a key pillar of its impressive economic growth. This skilled workforce spurred the transformation that produced the Celtic Tiger era of rapid growth in the 1990s and 2000s and is driving the current Celtic Phoenix phenomenon. What propels these achievements is education. Ireland's world-class knowledge economy is attracting investment and creating jobs in high-tech, life sciences, financial services and other innovative industries that can only thrive with an educated workforce. The same essential ingredient is central to the dramatic economic success of countries like Singapore, South Korea and China. Leaders in developing countries around the world want to see that kind of progress for their people. They know that an educated population can drive national economic prosperity, better health and environmental outcomes, social advances and political stability. But even when developing countries invest significantly from their own limited resources, they need help from others to create positive change in their education systems at a scale that truly transforms society. That's why it's so encouraging to hear the Irish Government's recent commitments to substantially raise its overseas aid contributions to help developing countries overcome the economic, education, health and environmental challenges they face. Earlier this year in Dakar, Senegal, Ciarán Cannon, Ireland's Minister for the Diaspora and International Development, told world leaders at the Financing Conference of the Global Partnership for Education (GPE) that Ireland would double its pledge to GPE to €25m between now and 2020. GPE is the only international partnership and fund that supports children's learning in poor countries by making lasting, breakthrough improvements in their countries' education systems. Mr Cannon's announcement drew enthusiastic applause because it was a historic moment for Ireland and for the developing world: Ireland was declaring its intent to play a leadership role in global development generally and education specifically. With its contribution to GPE, Ireland is strengthening our efforts of working directly with our developing country partners - in Africa, South Asia and across the Indo-Pacific - to help them ensure that children in classrooms are getting a quality education and all the benefits that flow from it. Developing country leaders also know that if their girls and young women are given real opportunities to stay in school and complete their education, their communities will be stronger, their families healthier, and their countries will enjoy a better future. This means the barriers that keep girls out of school - such as early marriage, child labour, gender bias, threats of sexual violence, inadequate sanitary facilities and the lack of female teachers who give them confidence and support - must be addressed. GPE works actively with developing countries to get girls in school and learning. For example, Afghanistan has worked with GPE's support to train and recruit more female teachers. Most of GPE's activities are in countries deeply affected by human conflict, poverty and natural disasters. 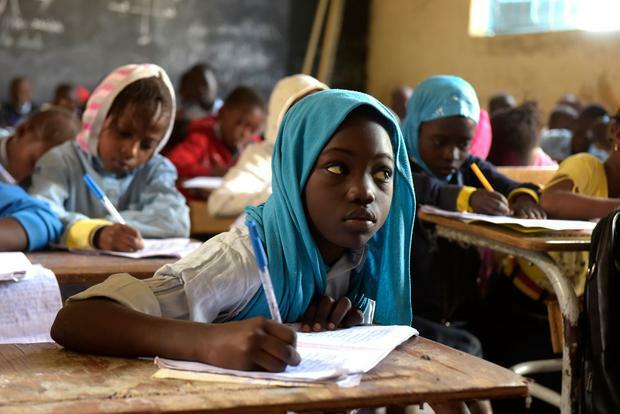 We support countries like Chad, one of the world's poorest nations, to deliver quality education not only to its own children but to the hundreds of thousands of refugees who sought protection in Chad over the last few years, fleeing terrorism and civil war at home. We support countries such as Kenya to incorporate innovative technologies that strengthen education data collection and planning, encourage stronger teacher performance and track the progress of students throughout their schooling. GPE supports countries with national priorities - as in Cambodia - that give many more children, especially the most disadvantaged, the opportunity of early childhood learning programmes, which have been proven to boost students' performance in school and as they enter the workforce - contributing to stronger economies and more prosperous societies. These and many other interventions are already helping some of the poorest countries to strengthen their human capital in order to follow Ireland's leading example and become the next 'tiger'. This week, GPE's board is meeting in Dublin. We are here to continue our work and to say "thank you" to the Irish people and their Government for its commitment to the hope we share for a better future through quality education for all. Julia Gillard, the former prime minister of Australia, is the chair of the Global Partnership for Education's board of directors, which is meeting this week in Dublin.